September | 2014 | Hotel Ascona Events & News : Hotel RENEWED ! Building Bridges through Music : Hotel Ascona, mini-concerto e apero gratuiti ! Centre for Studies of Society and Culture Ascona: To Encourage Understanding, Respect and Peace Internationally. 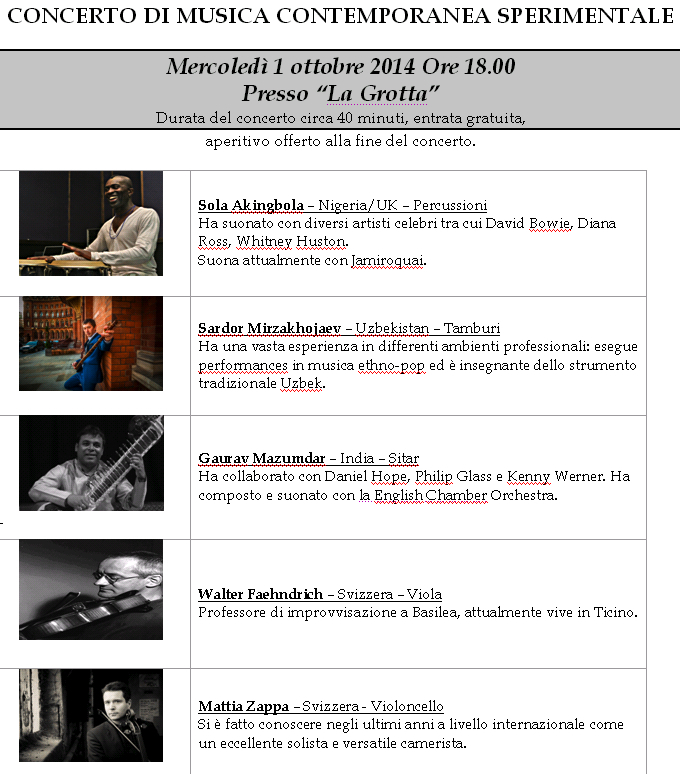 Il concerto “Building Bridges through Music” vuole essere un pretesto, come dice il titolo, per permettere l’incontro, lo scambio fra culture diverse attraverso la musica :https://hotelascona.wordpress.com/2014/09/16/concerto-di-musica-contemporanea-sperimentale-ascona/ . Five accomplished musicians from diverse traditions will be working together as residential artists at the Centro Inctri Umani, Ascona, and will be playing separetely in small events, before performing together for the public at the Hotel Ascona, at Teatro San Materno, Ascona (2 October), the Chiesa Evangelica Riformate, Lugano (4 October) and Teatro Sociale, Bellinzona (5 October). There will also be a number of broadcasts on RSI, DRS and other outlets. The musicians are Sola Akingbola (Nigeria/UK – percussion); Walter Fähndrich (Switzerland – viola) )Gaurav Mazumdar (India – sitar), Sardor Mirzakhojaev (Uzbekistan – dutar, rubab, tanbur) and Kuntal Roy (India – tabla). The Cross Cultural Centre Ascona (Centro Incontri Umani Ascona) is a recognized Swiss Foundation. It was set up by Dr. Angela Hobart, London, in the memory of her parents, Dr. Edmund and Margiana Stinnes – von Gaevernitz. The aim of the Centre is to encourage understanding, respect and peace internationally, which is especially important in our contempory era, beset by natural disasters and widespread human conflict. The Centre addresses issues of cross cultural concern in the domains of society, politics, philosophy, art, religion and medicine. By encouraging exchange among scholars, students, artists and laypeople of different countries and disciplines, the Centre seeks to honour the capacity of humans to revitalize consciousness and remake their lived realities.